There are a range of events today across Scotland to commemorate International Workers Memorial Day. On this day we remember the Scottish workers who have died in the past year as a result of industrial injury or disease. 26 people lost their lives as a result of workplace accidents last year with a further 8910 suffering major injuries. In addition there are workers who have been killed in work related road traffic accidents, as a result of occupational diseases or in incidents investigated by other agencies that do not appear in these figures. This is the first year the day has been formally recognised by the UK government and that is reflected in a statement by the Prime Minister and the attendance of Scottish Government ministers at events. UNISON believes that it is a basic human right that a worker and their families should be safe in the knowledge that they will return unharmed after a day at work. For that reason we believe that stronger health and safety laws and effective enforcement are essential. We do not support the argument that this is ‘red tape’ to be downgraded to self regulation. In the Scottish Parliament today giving oral evidence to the Finance Committee on budget strategy. Specifically, the Committee is considering what preparation should be underway now by the public sector to ensure the efficient delivery of public services within a period of tightening public expenditure. Not a lot of common ground in this session with some robust exchanges. The Scottish Chambers of Commerce and the CBI drumming up business for their members by calling for the wholesale privatisation of public services. The STUC and I setting out a very different strategy based on our alternative budget. The first session consisted of a video conference with Canadian finance officials on their experience of managing budget cuts. Interestingly they confirmed that there was little evidence that investment in top down efficiency exercises delivered downstream savings. Just what our research and experience of shared services has found. The business leaders churned out their usual array of assertions about public service reform with little evidence to back any of it up. We highlighted different approaches based on meaningful involvement of public service staff, rather than the latest management speak promoted by management consultants. Questions from MSPs covered a range of issues from public sector pay and pensions to the Council Tax freeze. If there was any common ground it was that efficiency savings alone will not cut the budget deficit. More radical solutions are required and our view that involves fairer taxation, clamping down on tax avoidance, and cutting real waste including PPP, Trident, ID Cards and the use of management consultants. Today is the Hope not Hate day of action against the BNP and other far right parties in the UK general election. We are fortunate that the BNP has a tiny footprint in Scotland. But that is no reason for complacency and they have to be challenged whenever they appear - such as the recent EDL/SDL ‘events’ in Glasgow and Edinburgh. More anti-BNP events have been organised in this election that before because decent Scots are determined that the BNP’s message of hate should not develop in Scotland as it has in some parts of England. We have focussed on our own members and supporting activity in the handful of seats the BNP are contesting. There has also been something of a fallout amongst the small number of fascists actually based in Scotland with three of their planned candidates pulling out. That has brought Scott McLean back to stand in Glasgow North-West where I was this lunchtime. The BNP try to portray a new smart image – fascism in a suit. Their problem is that McLean and his ilk just remind everyone what they are really like behind the glossy veneer. A quick search through YouTube will show you a clip of McLean giving Nazi salutes and more. UNISON Scotland believes in a dynamic and inclusive multicultural society, one that values all its members equally, irrespective of their race, nationality, gender, sexual orientation or disability. UNISON represents everybody - the BNP does not. I am doing a session at a procurement seminar for branches in Ayrshire this afternoon. The financial situation means that a number of public service organisations are looking to make savings through their procurement strategy. Some are being misled by management consultants that there are savings to be made from outsourcing. Regrettably PSO’s do not always do procurement well. A recent example was Edinburgh City Council who made a complete mess of a social care procurement, to the extent that they revisited the evaluation when it didn’t produce the lowest price. That council’s report into Alternative Business Models was full of unproven assertions on both price and quality. There are similar stories across Scotland, particularly involving the voluntary sector, where there appears to be a race to the bottom in terms of quality. Even the Scottish Government officials are struggling to produce coherent guidance. A recent consultation on social care procurement is almost silent on staffing issues and even omitted the Government’s own statutory guidance! Our submission to that consultation covers this and much more. For this reason we have produced a range of materials for staff and branches to assist them in managing the procurement process more effectively. This has been followed this up with a comprehensive training programme. Poor procurement practice not only results in poor value for the taxpayer, but can have a devastating impact on services. I arrived at my house last night to pick up my first election leaflet from the Liberal Democrat candidate. The main claim in this leaflet states “Conservative pay policy will cut the pay of any soldiers earning more than £18,000. This pay freeze will also hit nurses and newly qualified teachers – all to pay for Tory tax breaks to benefit millionaires”. Good stuff, a candidate championing public service workers. Even if he has no doubt recognised the large public service workforce in the constituency. The problem with this claim is that the Scottish Liberal Democrat manifesto also proposes a real term pay cut for these very same public service workers. In fact it is a key element of their cuts plan. So if our Liberal Democrat candidate is going to be a champion for public service workers, he should read his own manifesto a bit more closely and check with his party leaders. We expect a bit of hypocrisy in an election – but saying different things to different audiences is simply dishonest. Day three at the STUC is traditionally somewhat quieter in terms of policy. None the less a highlight this morning was the Helen Dowie Award for Lifelong Learning. This year it was won by UNISON and Unite Learning Representatives and Strathclyde Partnership for Transport. I always find the success of trade union learning particularly inspiring. They often give workers who didn’t do well at school the opportunity to benefit from a range of learning opportunities and represent what the trade union movement is all about. We also heard from the First Minister, Alex Salmond MSP. Like Labour Leader Iain Gray yesterday, there was considerable substance to the speech when focussing on the joint work between the STUC and the Scottish Government. Colleagues from England visiting the STUC are always surprised at the level of joint working with the Parliament and Government in Scotland, irrespective of the party in power. Of course being Alex, the second half of his speech was a typical barnstorming performance promoting SNP positions in the election. The STUC’s strong international links were once again on display in a series of debates on Europe, Palestine and other parts of the world in struggle. Sadly the restrictions on air travel limited the usual contributions from trade union representatives across the world to Congress. The afternoon session was dominated by debates on the rise of the far right. The trade union movement has a proud record of opposing fascism in all its forms. The BNP vote in Scotland is not high, but we cannot afford to be complacent. Hope not Hate Scotland have all the campaign materials we need to challenge racists wherever they stand. The main feature of the manifesto is making the first £10,000 of income tax free. Whilst this would be a welcome tax cut for our lowest paid members it is questionable if this is best way to support the low paid. This is because middle and high earners also gain from this method of cutting income tax with the consequent cost. Low paid workers will be less impressed by the plans to cut public sector pay in real terms and attack their modest pensions. The commitment to abolish the minimum wage age rates is welcome, but the manifesto says nothing about increasing the minimum wage or for that matter supporting the Living Wage campaign. Fair pay audits is also something UNISON would support, but why only for organisations employing more than 100 staff? Spending commitments would like the Tories be paid for by cutting waste. At least there is more detail in this manifesto, including welcome cuts in the use of management consultants, but it still looks pretty optimistic. Not replacing Trident is one way we would support, but the manifesto actually only commits to not replacing on a like for like basis. This would reduce any saving. The manifesto is strong on climate change and the Liberal Democrats have a good record on this. However, the energy policy rejects both nuclear and coal, a position that is simply not credible in Scotland. A balanced energy policy is the best approach. The partial sale of Royal Mail is not consistent with a commitment to the universal service. We also have populist but meaningless statements on cutting ‘red tape’, using the widely discredited sunset and ‘one in one out’ clauses. Given the recent boost in Liberal Democrat poll ratings this manifesto is likely to come under some scrutiny as the campaign develops. As usual with the Liberal Democrats it is a bit of a curate’s egg, particularly for workers. Back to the BBC this evening to comment on the SNP manifesto launch. The SNP manifesto has content that UNISON could support. Opposition to public service cuts and a wide range of spending programmes makes a good read. We would have common cause with some of the real waste, such as scrapping Trident – even if nothing is said about some of the Scottish Government’s wasteful programmes. Of course the SNP has the easiest manifesto to write. They have no ambitions to govern at UK level and therefore don’t have to make any of the hard decisions. An independent Scotland would have been in the same position as Iceland when our major international banks went bust and were bailed out by the financial clout of the UK. Whilst we could support many of the SNP public service plans the same cannot be said of many of their economic policies. The low tax model exemplified by the council tax and business rates freeze would be carried forward with Corporation Tax cuts. There is no evidence that businesses use these additional resources in ways that benefit the economy and they are inevitably at the expense of properly funded public services. As set out by speakers in the energy debate at the STUC today, the SNP energy policy has major flaws. There is simply too much emphasis on renewable energy at the expense of a credible balanced energy strategy for Scotland. We and the other energy unions are very sceptical about any claim of 60,000 green jobs. With a hung/balanced UK parliament looking at least a possibility, the SNP see this as an opportunity to negotiate a better deal for Scotland. The idea that a UK political party could give preferential spending priority to Scotland is frankly risible. The best defence against the savage Tory spending cuts in Scotland remains a Labour government. Day 2 at the STUC started with the debate on public services. UNISON Scottish Secretary, Matt Smith opened the debate referring to the STUC Public Services Charter. That Charter sets out a radically different vision for the development of public services in the current financial crisis. A range of speakers highlighted the impact of cuts on all parts of Scotland’s public services. South Lanarkshire TUC helpfully tabled a motion opposing the privatisation of Scottish Water. This was an opportunity for me to update Congress on the latest sharks circling around Scottish Water, including the Scottish Futures Trust and the Water Industry Commission. The Morning Star newspaper yesterday carried an article from us setting out the case for democratic control in more detail. Congress again made it clear that it’s Scotland’s water and it’s not for sale! The afternoon session was focussed on young workers. The STUC Unions into Schools project is important in raising awareness of the role of trade unions and we heard inspiring presentations from some of the schools involved. Equally important was the debate on promoting young workers rights including apprenticeships, tips and the minimum wage. A presentation on the Living Wage campaign also emphasised the importance of making real progress on low pay. The STUC is calling on the Scottish Government to follow the example of Glasgow City Council and Scottish Enterprise. The final debate of the day was on energy and climate change. There is a cautious welcome to Ed Milliband’s recent recognition that the market isn’t going to deliver the necessary cuts in carbon emissions. This is reflected across Europe where municipalities are ending the privatisation of electricity facilities. The market has also failed the fuel poor. One in four Scottish households are in fuel poverty and rising fuel prices have undermined the work of fuel poverty programmes. I took part in a BBC radio programme this evening in response to the Scottish Conservative manifesto. Frankly this is an incredible document. They are proposing a 15% cut in the Scottish budget, that’s around £5bn. Yet at the same time want to protect the NHS budget, freeze the council tax and business rates - and protect police numbers. I know it’s an election, but this simply doesn’t add up. The NHS alone is one third of the Scottish budget, so you would have to cut whole swathes of services to do this. Then you have the privatisation of Scottish Water. That would result in a massive tax hike for water charge payers as they pay for the purchase price, dividends, profits and fat cat salaries. They also require the Scottish Government to implement the recommendations of the Independent Budget Review. This is without even viewing the recommendations. We elect politicians to make decisions on our behalf – not to hand those judgements over to three 'wise' men. We still live in a democracy and that means politicians have to be accountable for decisions, not technocrats. As I said earlier - incredible! My blog for the next few days will be from the STUC meeting in Dundee. The focus this morning was on the economy and industry with speakers critical of the neo-liberal economics that got us into the financial mess. James Corry from UNISON’s Skills Development Scotland branch focussed on Scottish Government cuts in the modern apprenticeship scheme, from 20,000 to 15,000 places. This also means that the helpful extension of the scheme to 20 year olds will end. The STUC is often held in the middle of election campaigns. Jim Murphy addressed conference in the morning and Nicola Sturgeon in the afternoon. Nothing much that was new in either contribution. However, there was welcome support from Jim Murphy for the campaign against the privatisation/mutualisation of Scottish Water, something you rarely hear from a UK Cabinet Minister. We sponsored a well supported fringe meeting at lunchtime on Hugh Henry MSP’s private members bill that seeks to strengthen the legal protection for public service workers who are the victim of violence at work. The meeting heard many examples of the disgraceful attacks on workers and the need to get more MSPs to take this issue seriously by supporting the Bill. UNISON’s first motion, on occupational pensions, was debated in the afternoon. Mike Kirby, Scottish Convenor of UNISON, pointed to the closure of large numbers of decent private sector pension schemes, and rightly raised the spectre of a huge increase in benefits demands by their short-changed staff. Essentially the private sector wants the public purse to bail out their employees’ pensions shortfall, just as it bailed out the busted banks that caused this recession. Attacks on quality public sector schemes by the CBI and others are just a smokescreen for this. But they would also dump another huge bill on the taxpayer. I gave a presentation on the public finances to our Young Members Committee today. The election campaign is beginning to clarify the impact of Tory cuts on Scotland with the announcement that they would be looking for £5.1bn of cuts (that's around 15%) to the Scottish budget. That is far higher than the estimated £3bn in the mainstream post-UK Budget estimates. At least not all business organisations have lost the plot on public spending. The Scottish Chambers of Commerce have highlighted the importance of public spending to the economy, particularly on infrastructure contracts. A point reinforced by the construction industry. However, we have the completely daft Institute of Directors calling for savage cuts in public spending, whilst at the same time demanding more public infrastructure spending! The overall financial position is of course the same for all age groups, but there are particular concerns for young people. Youth unemployment has gone up by 89% over the past few years. Although the rate of job loss came down rapidly last year to 17%, that still leaves a large group of young people without jobs. Of particular concern to UNISON is the impact on young people who have been studying for an entry qualification for a public service job. Most public service organisations are freezing posts and that hits new entrants particularly hard. Last year there was a welcome increase in Scottish Government funding for apprenticeships creating 20,000 jobs. This year that is likely to be cut to 15,000. Another way of increasing the numbers of apprentices would be to specify a requirement for apprentice numbers in public contracts. This could be particularly effective in big public construction contracts. We are also concerned that young people could be badly hit by local government service cuts. For example, Community Education, including youth work, is being targeted for cuts as are libraries and some social work intervention services. On a more positive note UNISON membership amongst young people has been increasing proportionately quicker that other age groups. We have a great group of young activists who understand the issues and have a real appetite for campaigning. This is really good news for the future of the movement. A few days off in the glorious sunshine of the West Highlands and it’s back to the final preparations for our contribution to the UK general election campaign. A general election in Scotland is different to the rest of the UK. Most of our members are employed in services that are devolved to the Scottish Parliament and therefore the UK debate sometimes appears irrelevant. However, the UK government does control the total amount of public spending, an issue that is of vital interest to our members. There are three elements to UNISON’s election campaign activity. Public Works: A range of media adverts will appear promoting the role of public services during the campaign. There will be a Public Works insert in our members magazine that includes Q&As to the main political parties on relevant issues for UNISON members in Scotland. Members and branches are encouraged to raise these issues with candidates. Members will also be contacted encouraging them to vote. Anti-BNP: Whilst the racist BNP vote in Scotland is low, it has been growing and they plan to stand candidates in a number of Scottish seats. We will work with our members to explain how the fascists seek to exploit the recession with their message of hate. Public campaigning effort will be undertaken mostly through our partners Hope Not Hate Scotland and Unite Against Fascism. Labour Link: Our affiliated fund again works primarily with members to explain our take on the Scottish Labour message in this campaign using a variety of media. There are also 9 UNISON members standing as Labour candidates. Their constituencies and others that have candidates supportive of UNISON’s positions will receive support. Still a lot to do but like millions of others I am drawn to the leader’s debate on TV. Just try and remember that domestic issues largely mean English issues in tonight’s debate. Great day today. 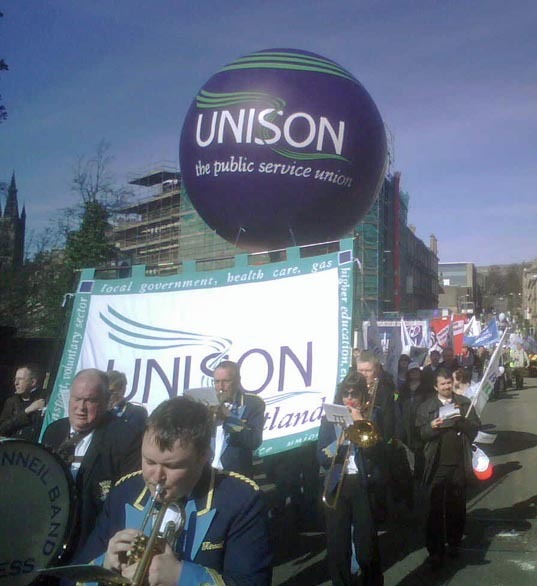 Marching through Glasgow in glorious sunshine with thousands of UNISON members to defend our public services. UNISON President Gerry Gallagher summed up our case at the rally in Kelvingrove Park when he said; "Our members didn't cause the crash, and neither did the people we serve every day in communities across Scotland". Our members coming together like this is what trade union solidarity is all about. We may not have the resources of the business funded campaigns to slash public services - but we have real people. And when they come together at events like this, they are more powerful than the slickest video or media stunt. 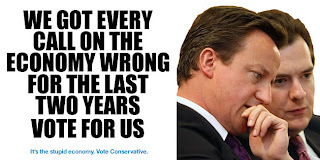 It is getting very hard to take anything the Tories say on the economy seriously. Their so called ‘efficiency guru’ Sir Peter Gershon has said that controls on public sector recruitment, which would include not filling empty posts, would save “perhaps £1bn to £2bn” in 2010-11. This is surely the worst sort of back of an envelope electioneering. Obviously no one has told this ‘guru’ that most public sector employers have been freezing posts for months. Although he could perhaps have opened a newspaper, or visited the job portals to see for himself. Then we have the Tory business leaders telling us that jobs will be lost if the NI increase goes through. Well they certainly will in the public sector to pay for this latest Tory election pledge – around 40,000 to be precise. But in the private sector? Aren’t these the very same Tory business leaders who told us that the minimum wage would result in massive job losses. Finally, we are told that David Cameron will "ask a fair pay review to consider how to introduce a pay multiple so that no public sector worker can earn over 20 times more than the lowest paid person in their organisation." A fine idea David, and you will be extending this principle to the private sector? In particular to those same Tory business leaders whose pay and pensions have been multiplying way above 20 times their lowest paid workers? If you want to defend public services, come and join us in Kelvingrove Park, Glasgow tomorrow. Real people from real communities who rely on public services. No fat cat pay and pensions for them. See you there! Early start this morning to do an interview on the BBC responding to the latest report calling for the privatisation of Scottish Water. Actually not really a new report but a retread of a report published a few years ago by the same consultant - nothing new there then! The core argument is that because of the financial crisis the Scottish Government can no longer afford the small borrowing line it provides to Scottish Water. It could be spent elsewhere on ‘front line’ services. Since when is providing quality water supplies and removing sewage not a front line service? The options they claim, not surprisingly, all involve privatisation. The first option is more PFI. Well Scottish Water gave up on PFI some 12 years ago for good reasons - because it costs a fortune. Even the pro-privatisation Water Industry Commission has stated that the schemes are not cost effective. Then we have privatisation/mutualisation. In this option we would sell off assets built up over many years, at taxpayers expense, at a knock down price. Add to that dividends, profits, fat cat salaries and consultancy fees - all to be funded by the water charge payer. Ask any fan of Manchester Utd if they think bringing in a new debt laden owner is a good business model! This report also claims that the regulation of Scottish Water is a model for the rest of the public sector. Sorry, I thought it was such a failure you wanted to privatise it? The problem with this argument is that the efficiencies in Scottish Water have been driven by a massive capital programme. Not an option that is likely to be available in the coming years. And even if it was most public services rely on people. You can't deliver home care by telemetry. Even this report recognises that Scottish Water is a public sector success story. So why wreck it? The reason is that the usual suspects just hate a successful public sector model. It goes against their dogma - it doesn't fit the ideology. Be prepared for more nonsense like this in the coming months as the financial crisis is used as an excuse to promote privatisation. The right to additional paternity leave allows fathers to benefit from up to six months' additional paternity leave if the mother returns to work before using her full entitlement to statutory maternity leave. The new right is available to parents of children with an expected week of childbirth beginning on or after 3 April 2011. The scheme has been created by the UK Ministry of Justice to help successful employees recover compensation from their employer where it has failed to pay a tribunal award. A right for employees to make a request in relation to study or training, for example to request time off for training, is introduced from 6 April 2010. Statements of fitness for work, or "fit notes", will replace sick notes from 6 April 2010. The new fit note is intended to give employees and employers greater flexibility in managing sickness absence and to help more people to get the support that they need to get back to work. The standard rates of statutory maternity, paternity and adoption pay increase from £123.06 to £124.88 per week from 4 April 2010. Modest changes perhaps, but in the right direction. With the election starting gun being fired today, it is worth remembering the significant improvements made in employment law over the past 13 years. And more importantly, how those gains would be under attack from a Cameron government. We are back on pensions today leading the fight back for public sector pension schemes in Scotland. The usual suspects churn out misleading statements about ‘gold plated’ schemes or a ‘pensions apartheid’ between the public and private sectors. The real pensions ‘apartheid’ in Scotland is between workers and the fat cat company directors who fund the campaign groups attacking fair pensions. They are also using pensions as part of their wider campaign to get workers to pay for the financial mess their economic dogma has caused.  The average occupational pension in the UK is £8,100. The average council pension is £4,000. Meanwhile top city bosses pick up over £200,000 per year and unlike most of them, our members pay contributions.  Without public service pensions many more retired workers would have to rely on means tested benefits including Pension Credit, a passport to further benefits.  Scottish local government pension funds invested nearly £20bn last year, which equates to one fifth of the total Scottish GDP.  Whilst the cost of pensions will go up in the short term so do other costs associated with an aging population like state pensions and long term care. Public service workers are paying higher contributions for their pensions that are an integral part of their pay and conditions. The real pensions scandal is that taxpayers are being forced to pick up a massive benefits bill for private sector workers, who have had their pension schemes cut or undermined by unscrupulous employers, and that every year an estimated £10 billion of taxpayers’ money is spent subsidising the private pensions of the top 1 per cent who are paid more than £150,000 a year. All workers are entitled to a decent pension scheme. That should be the focus for all politicians, rather than falling for the myths peddled by those responsible for our current economic woes.